the ancient art of the "alembic"
In Valle di Cembra the word "lambicar" had the double meaning of surviving poverty by using one's wits and using the small resources one had, and of using up to the very last drop of grape material by distilling its precious skins. For us, "alambiccare" means to choose the right raw materials, to know how to ferment them properly, preserve them for the right length of time and distil them using the excellent batch distillation alembic. 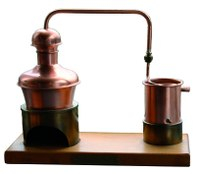 So we redesigned the distilling apparatus so as to get the very most out of them, and since we are perfectionists we added new parts that could further exalt the quality of our Grappas and Brandies. Over time, our range of Single Variety Grappas has considerably grown and often enough the meeting of local pomaces with those coming from other parts of Italy has provided us with new and useful knowledge about the art of distillation. In addition to Grappa, we distil various kinds of Fruit to produce Williams Pear, Apricot, Apple and Quince brandies as well as Grape and Wine brandies. Our special technique in preparing fruit purees, careful fermentation and proper distillation allow us to transfer all of the freshness and fragrance of the fruit into our distillates.